You are here: Home / Blog / Yeast Infection No More Review: It is A Scam! Don’t bother buying Yeast Infection No More by ‘Linda Allen’ because it is a scam! Whoever is marketing this product simply gathered free information from authority medical portals into an eBook … and nothing new or special can be found in it to warrant your spending your hard-earned money on it! Created in 2006, Yeast Infection No More (link to website) claims to have information that will cure your manifesting candidiasis in 12 hours and eliminate the root cause in 30 days. But I hate to break it to you that all it contains is information stolen from medical portals … and considering that the target disease has been known for centuries, the probability that the treatment being offered in the book is outdated is 90% if not 100%. Besides, I have gathered evidence proving that we are dealing with another long-running scam so lets dig right in. 1. Linda Allen Does NOT Exist! According to the voice in the presentation video, Linda Allen is a ‘certified medical researcher, nutritionist, health consultant and former yeast infection sufferer’ who, for the past 15 years or so, has helped ‘over 143,000 women and men in 157 countries worldwide’ to cure their Candida infection. Wow … over 143,000 people? Then she must be very popular, right? Unfortunately, that’s not the case here. to naturally treat Candida infections.’ There is not even a real photo of her on her own website, save for a cartoon drawing of a woman wearing cute eyeglasses. There is no way of verifying the claims of Allen’s identity, which leads me to the 100% correct conclusion that she does NOT exist! To recap, Linda Allen is a woman, right? 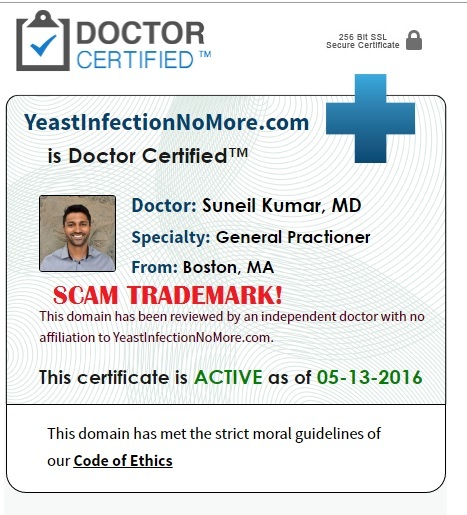 If that is correct, then why is it that Dr Suneil Kumar, a man, is certified as the ‘owner’ of Yeast Infection No More by the shady Doctor-Certified.com? This only goes to confirm my earlier conclusion that this Linda Allen is nothing but a name anyone can fabricate. Also remember that Suneil Kumar is the same doctor whose stolen identity was used to endorse other scams like The 3-Week Diet, Red Smoothie Detox Factor and ED Miracle. So my seeing him here again endorsing another scam does not come as a surprise to me, or to any regular reader of this blog. Remember: Any website with ‘Doctor Certified’ logo floating on it is a SCAM! If you don’t believe any word of what I’ve just written above concerning this product, then at least believe the words of actual patients who had bought and read the book. A lot of these complaints you can read at CureZone.org … and one particularly common complaint is that Yeast Infection No More contains information that is already available for free online and absolutely nothing new or original that can help with Candida infection treatment. This only serves to prove that Yeast Infection No More is a worthless scam you should never waste your money on! Apart from these, there is another important red flag: In the video, the voice actor urges you to sit back and watch it to the end because ‘it won’t be online for long.’ Now according to Whois Data, Yeast Infection No More was created in 2006. Now we are in 2016, exactly 10 years later, and the video is still online. Final Conclusion: DON’T BUY Yeast Infection No More. It is a Scam! Candidiasis (yeast infection) is an ancient disease, and there is a ton of free, useful information about remedies for its treatment. Remember that Candida albicans, the yeast responsible for the infection, cannot be eliminated from the body as it is part of the normal flora. It only causes trouble in the body if there is any suppression of immunity in the body due to other diseases, drugs, etc., and can also be spread from one person to another via sexual promiscuity and poor hygiene. So your best bet for its treatment is to consult your doctor, who will identify the exact cause of your yeast infection and prescribe the appropriate treatment. This Yeast Infection No More eBook may have worked when it was first released in 2006, but as you have seen already, it is worthless! Keep your money and spend it on something more useful. Thanks for your good work in exposing this scam. Notice that in the Google search results for “Yeast Infection no more” there are several websites saying they review it and the word “scam” but when you visit the site it is just a portal to get you to buy the product. 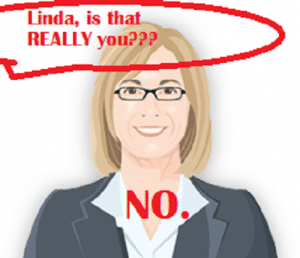 It looks like “Linda Allen” has been busy creating reviews and review websites for “her” own product. This is further evidence of a scam, and for any product that sets up review websites for itself shows it must be a scam. Thanks for your contribution and appreciation of my work. I feel encouraged! There is a Nutritional Specialist by the name of Robert Harrison. He is the owner of Get Healthy Again. He lives in Homer, Alaska. You can find him online which features his products from in depth studies. There you will also find his contact information. Alaska is 3hrs. behind us. Go to his website ,Get Healthy Again.com. You can email him or call him. I hope this will help you. Try to speak with Mr. Harrison or have him return your call. Hey Obinna, I just found your scam exposing website., Great work! I’m happy to send to a copy of my book called Candida Crusher (712 pages). I’m a naturopathic doctor of 30yrs experience – you can see me all over the internet and i DO in fact exist on the Candida Crusher You Tube channel (800 videos), Facebook, Twitter, etc. You can see my website http://www.yeastinfection.org and more. There are honest physicians out there as well. It is a shame that some scammers give people like me a really bad name. I am NOT a scamming person and never have been. Incidentally, the guy who owns yeastinfectionnomore owns several other scam books, including a psoriasis book as well. These books are a complete joke, and a lot of this information is junk. People can request a refund within 60 days of purchase on ClickBank though. I just went through your work and I’m impressed! Use my Contact page. Let’s talk. Hey I read this book a couple of years back. It’s a very complete book with lots of well-researched info backed up by studies.. I didn’t have a severe yeast problem so I don’t know if it would cure people with real long term issues, it was for my wife to get rid of rosacea. But I see here you don’t even review the book. What’s the point? Just calling everything a scam because they use aggressive sales copy doesn’t mean it’s a scam. Lots of products out there use aggressive advertising and fake actors. Are the people in TV ads real people? Exactly. Maybe you should shell out for the book if you want to review products properly.